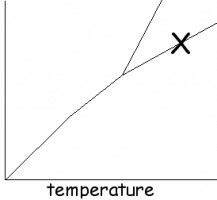 1 - Given the following standard phase diagram (temperature vs pressure) of compound y, what phase or phases of matter are present at point x? 2 - Who is credited with the wave theory of light? 3 - What is one difference between RNA and DNA? 4 - What are the craters on Venus named after? 5 - The Three Gorges Dam in China will be the world's biggest when complete. When did the construction start? 7 - What is the name of the largest known cellestial body belonging to the Solar system that lies beyond the orbit of Pluto? 8 - Which is not one of the six classical simple machines? 9 - Which element was named after the country 'Cyprus'? 10 - Which famous Astronomer had a gold prosthetic nose, having lost the real one in a duel? 11 - What is the number phi equal to? 12 - Who was the only US Astronaut to fly aboard Gemini, Apollo and the STS (Shuttle), including two maiden flights? 13 - Of the following animals, which is the most closely related to humans from an evolutionary point of view? 14 - Which of these is an example of an extremophile? 15 - What is the other giant spiral galaxy of the Local Group, along with the Milky Way? 16 - Which of these aircraft designers was responsible for the Hawker Hurricane fighter plane? 17 - Who is the only person to hold a patent on a chemical element? 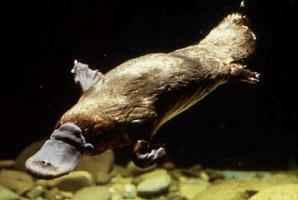 18 - The mammal pictured below has a number of nearly-unique characteristics for a mammal. Which of the following is NOT one of them? 19 - Which of the following is not a formula for energy? 20 - What is the collective name for the asteroids that are co-orbital with Jupiter?